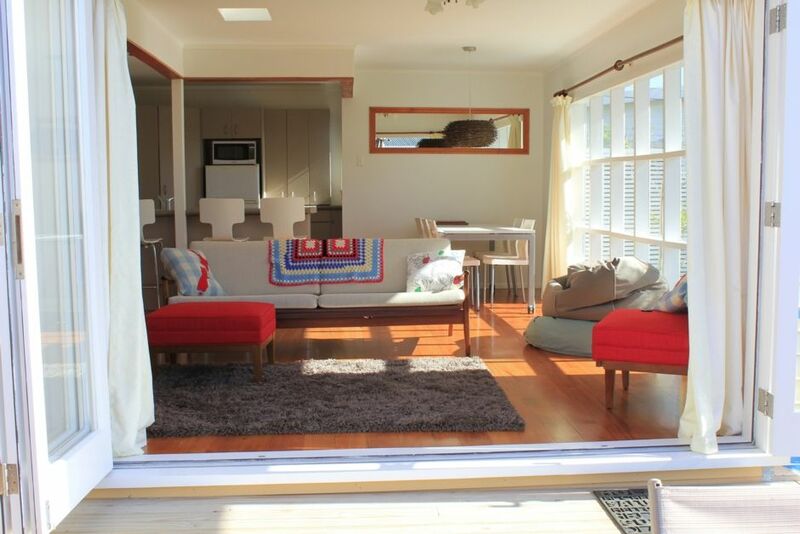 Cute 3 bedroom 'original' kiwi bach with some modern conveniences like a dishwasher and WIFI. 5 minutes walk to 3 different beaches. Sea views from lounge and outdoor bbq area. Newish kitchen. Wooden floors, simple and clean. Perfect for families, fully fenced. Small garden for running about on. Safe beach for swimming. Lots of games. The bach has a heatpump and most beds have electric blankets, so even in winter you won't be cold. If 'clean and simple' makes you feel 'laid back and relaxed' then this is the bach for you. This is an original 1950's wooden bach that has been renovated. Its still retains its bach feel but has a nice modern bathroom and kitchen. Check out what our guests have had to say - there is lots of feedback and it will give you the idea. Please note there are 5 steps into the step down lounge which may make it unsuitable for the very old. Even if it rains there is plenty to do. Westfield Mall, movies, bowling, swimming pools, sports center all just five minutes drive away. Parking for two cars. Only 45 minutes North of Auckland by car or one hour by Ferry. All the relaxation of the beach but still plenty to do. 5 minutes to Gulf Harbour, golf courses, movies, shopping malls, regional parks, water skiing, fishing on the rocks. 25 minutes to Albany. Easily commutable to downtown Auckland by ferry or bus. There is so much to do in the area, here are a few websites you might like to check out before you arrive. All of these activities are 5 – 10 minutes drive away. P Alarms installed for your safety. Not a very big bach - its a traditional one. From our cottage you can walk to three different beaches within 5 minutes. Location was ideal, great views, well fenced for dogs. Like a traditional kiwi batch. Location fantastic, property was cosy, beds comfy and awesome views, we loved our much needed family time there. Thank you! Comfortable and homely. Well-equipped. We enjoyed our stay. Beaut bach, lovely place to stay!